Visiting Old Quebec Street gives you the impression of visiting a village in the heart of downtown Guelph. Both in history and in atmosphere, Old Quebec Street shares more in common with an indoor market than it does your typical shopping centre. The architecture is an elegant covered streetscape, reminiscent of a European city market such as Covent Gardens in London, England. Even features like the glass ceilings and the street-style layout are similar to these more famous ‘cousins’. Walking down the middle of Old Quebec Street, you get the impression that you’re walking down an actual street. Thanks to the open roof, the space is always filled with natural light. Signs hang from above the shops and the second storey windows and balconies overlook the main avenue. Visitors can sit on benches or enjoy a coffee on the patio—just like they would outdoors. Old Quebec Street also serves as a hub for Guelph residents, thanks to both its amenities and its central location. Often the shortest route across downtown passes through Old Quebec Street, connecting the bus station, the train station, the River Run Performing Arts Centre, the Sleeman Centre, St. George’s Square and many other city landmarks. 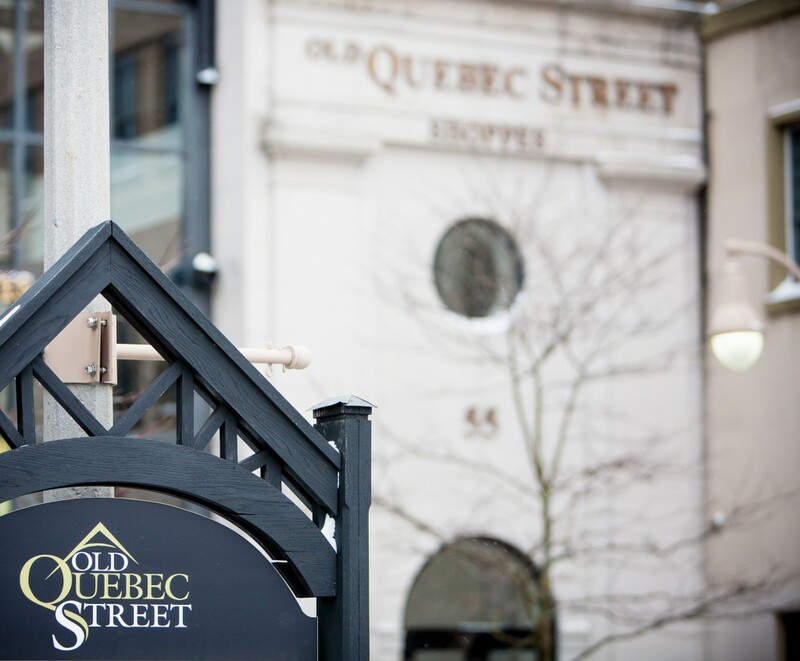 Visitors can come for a doctor’s appointment in the morning, a quick coffee, some errands & shopping, or even a sit-down lunch at one of Old Quebec Street’s restaurants. Where else can you find all these things under one roof? If you’re just passing through, on a rainy day or during the winter months, the concourse of Old Quebec Street offers a respite from the outdoor climate. Old Quebec Street offers a holistic shopping experience for residents of downtown Guelph, uniting the atmosphere of a European city market with the convenience & variety of a modern shopping mall. This combination is what makes Old Quebec Street such a unique destination in the area. Visit our directory page to see all our shops and services!